A gluten-free lunch (or snack) doesn't get any easier. White corn tortillas are a regular staple in our pantry. Quesadillas, enchiladas, soft tacos, heuvos rancheros, layered Mexican casseroles- it's all gluten-free good. Grilling layered stuffed tortillas is a quick and delicious lunch; and the possibilities are endless. I'll start with one of my favorite simple quesadillas- spinach, tomato and cheddar. This recipe makes two quesadillas. Heat a griddle or large skillet over medium-high heat and coat with a dash of olive oil. Lay two of the tortillas on the hot griddle. 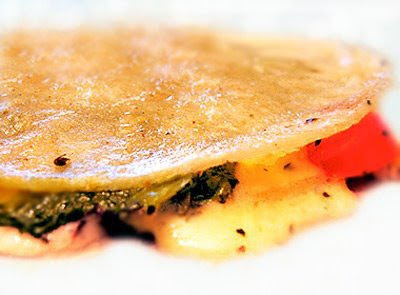 Cover each tortilla with a spinach layer. Add the tomatoes. Season with nutmeg or Old Bay Seasoning. Layer with slices of cheddar. Top each with another tortilla and press down with a spatula. Cook for a minute or two and carefully flip the quesadillas using a broad flat spatula. Press down a bit and cook until the cheese is melted and the tortillas are turning golden.